The preliminary round has been completed. After two days of playing in groups the participating teams are now facing each other in direct duels – the double elimination. Since the Men’s World Championship 2015 in Argentina, the International Fistball Association is using the double elimination system. The main difference as compared to the more typically used K.O. 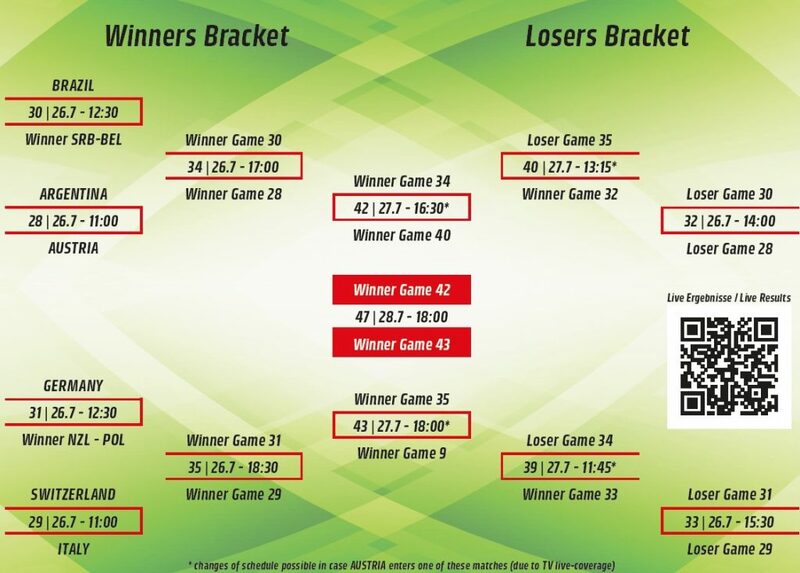 system is that losing once does not mean a team is out of the tournament, i.e. a given team would get a second chance, and could still go through to the semi-finals. Only after a second loss is a team out of the tournament. At the Women’s World Championship in Linz, eight teams will participate in the double elimination: Brazil, Germany, Switzerland, Argentina, Austria and Italy have already qualified due to their rankings after the preliminary round. They will be joined by the winners of two qualification duels – i.e. the winner of Serbia versus Belgium, and the winner of New Zealand versus Poland, respectively. “With the double elimination modality we have found an attractive format where every team has to give its best in each game”, says Winfried Kronsteiner, Chair of the IFA Sports Commission und Technical Delegate at the Women’s World Championship. The modality also means that there may be duels between the top nations early on in the tournament. The two losers of the qualification for the double elimination and the sixth placed team of Group B, the Czech Republic, will for the first time participate in the President’s Cup. In a round-robin format, these three teams will all play against each other. The two winners of these duels will then face each other again in the final of the President’s Cup – the winner of that match will both win the President’s Cup trophy and take the ninth place in the tournament. 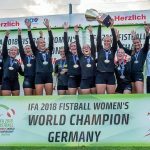 “This gives smaller fistball nations the chance to determine their winner, and will surely be exciting”, says Karl Weiß, President of the International Fistball Association.